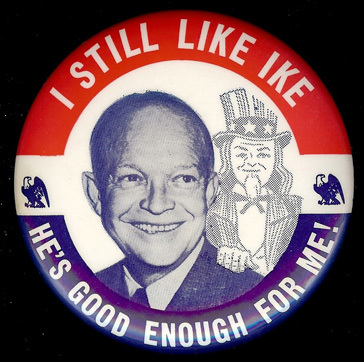 “I Like Ike” was a campaign slogan for Dwight David Eisenhower’s easy presidential victories in 1952 and 1956. The General who led allied forces to victory in Europe during World War II was a natural to lead the Republican Party to success at the polls over the cerebral Democratic nominee, Adlai Stevenson. Initial reviews of the Eisenhower presidency were not sterling. A common complaint that he was absent — or at least far too placid — when he should have been more exercised by disturbing developments abroad, like the launch of Sputnik or the advent of the Soviet Union’s missile and bomber capabilities. Barack Obama has absorbed similar criticism for not doing enough to deal with the Islamic State and the demise of Syria. Obama and Ike are two very different presidents, but they do have a few similarities. Both men tried to extricate U.S. forces from wars. Obama, like Ike, adjusts tactics without fanfare instead of changing fundamental strategy. Obama, like Ike, relaxes on the golf links, a form of replenishment that George W. Bush abstained from as an inappropriate display of enjoyment when his plans to topple Saddam Hussein and remake the Middle East turned into fire and ash. Ike could play golf with equanimity partly because he avoided over-reacting to foreign crises and fevered critiques by arm-chair warriors. Ike’s ratings rose as historians began to appreciate his “hidden hand” leadership style and how, in retrospect, his restrained responses were far more sensible than the proposals of critics with their hair on fire. The Eisenhower Administration faced more crises with nuclear dimensions than any other presidency. In September 1954, the Strategic Air Command went on alert after the shelling of Quemoy and Matsu, two islands held by Chiang Kai-shek’s Nationalist government off the coast of mainland China. In January 1955, the Eisenhower Administration ostentatiously moved nuclear-capable aircraft closer to the Taiwan Strait. SAC’s readiness levels were raised again in July 1958 during a crisis in Lebanon and yet again in response to heightened threat levels in the Middle East and along the Taiwan Strait in early 1959. Ike wasn’t alone in moving pieces on the nuclear chessboard: Soviet leader Nikita Khrushchev also used nuclear threats during the October 1956 crises sparked by Egyptian President Gamal Abdel Nasser’s nationalization of the Suez Canal. At no time in the Nuclear Age have nuclear feints and threats been so prevalent. But Eisenhower and his Secretary of State, John Foster Dulles, avoided the nuclear brink. They entered office underscoring the military utility of nuclear weapons by championing nuclear options as a low-cost alternative to conventional force structure. But they backed away from using nuclear detonations to break the military stalemate in Korea or to help out besieged French troops in Indochina. Ike’s military advisors argued for restraint because of the absence of suitable targets and the presumed requirements for a large troop presence after nuclear weapons’ use. His diplomatic advisors warned that using the Bomb would upset U.S. allies in Europe and alienate and outrage partners in Asia. In addition, Ike and Dulles could not be sure how the Soviet Union and “Red” China would react to nuclear detonations. The absence of battlefield use during the Eisenhower Administration was pivotal in establishing what Nina Tannenwald calls the “nuclear taboo.” The basis for this taboo lay in President Harry S Truman’s unwillingness to use nuclear weapons on the Korean Peninsula or against a China that didn’t possess nuclear weapons, despite all of the grief that attended the onset and brutal progression of the Korean War. The taboo took hold when Ike refrained from using nuclear weapons even though the United States enjoyed strategic superiority — not only during the Korean War, but also in multiple flash points in the Middle East and Asia. Ike set the bar very high against crossing the nuclear threshold for his successors – a historic achievement. Even so, nuclear enclaves in the United States and elsewhere continue to adhere to a belief system where nuclear weapons retain utility to influence behavior, especially during crises. For true believers, nuclear weapons still have outsized influence – even though they haven’t been used on battlefields for seven decades and can’t be used without horrific potential consequences. There is still no taboo against threatening the use of nuclear weapons. It can be formed only by imposing penalties on those who threaten first use. Note to readers: This post is drawn from a larger review essay of Nixon’s Nuclear Specter: The Secret Alert of 1969, Madman Diplomacy, and the Vietnam War by William Burr and Jeffrey P. Kimball that appears in the December issue of Arms Control Today. Having spent some time in the Eisenhower library earlier this year, I would highlight another nuclear issue important to his presidency: Through his Atoms for Peace initiative, Eisenhower set the scene for near-uncontrolled transfers of atomic capabilities to dozens of states in part out of ignorance and in part out of short term geopolitical interests. The existence of the Atoms for Peace initiative would ultimately shape and bound the control provisions associated with the NPT and, in my view, is the origin of many nuclear issues that we are still dealing with today. It’s an important part of his legacy that we should not overlook.